I am honored to participate in The Inspired Room Tour hosted by my friend, Melissa from The Inspired Room. We are celebrating the release of her new book, The Inspired Room: Simple Ideas to Love the Home You Have. Today, I am going to show you how a little inspiration over the years turned our kitchen and keeping room into a cozy home for our family. Yes, it was lovely. Yes, it was functional. Yes, I am grateful and so very blessed. To be honest, it wasn't really working well for our large family. The kitchen is located smack dab in the middle of the house. 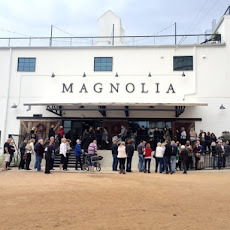 It is our main hangout. The "keeping room" or "family room" is just adjacent to the kitchen. We lived in our home and loved it for seven years. It was time. 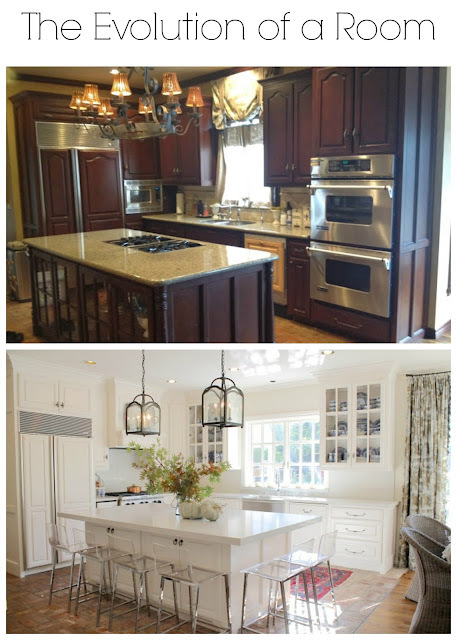 Using multiple sources for inspiration, I designed a new kitchen. Books, Pinterest, Magazines, and now Instagram are my primary sources of inspiration. Woah! Its a floral explosion in here! The Ralph Lauren sofa was mine from college days... I saved babysitting money to purchase that doozy, but it has gorgeous lines and I'm positive the floral is almost back in style. The slipcovered Henredon club chairs were wedding gifts. Notice the original windows. All the windows were replaced shortly after our kitchen remodel thanks to tennis ball size hail completely destroying our exterior. Slipcovers on the sofa, club chairs, and ottoman soften the room, yet still provide warmth and coziness. I am daily inspired by Instagram and Pinterest. Changing out accessories from time to time is an inexpensive way to update a room instantly. I scour craigslist, thrift stores, TJ Maxx, Homegoods, and Tuesday Morning for most of my accessories. The mantle over the stove was inspired by a photo on Pinterest. Drawer placement was inspired by a need for organization. Everything has a place. 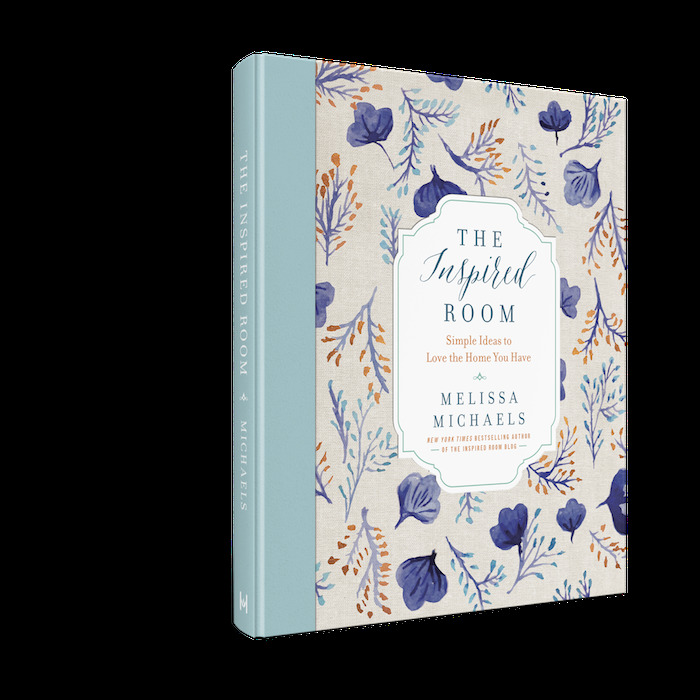 One of the blogs I have been the most inspired by over the course of many many years is The Inspired Room. Melissa has an approach to decor like no other. She takes the home she has been blessed with and completely transforms it, right before your eyes. Her photographs and descriptions, DIY's and Tutorials are down-to-earth. She shows real life happening in real time. That is why I was so excited when she released a book! I shared the book review with you here. Love the Home You Have is a witty and inspirational book on how to take your home from livable to lovable. Melissa gives practical advice on how to change your perception on your home and how to fall in love with your home. After I read her book, I was inspired to change my outlook on my own home. I even quit shopping stores and shopped my own home. My 2015 fall tour reflects that change (this is the before) I want to change my formal living room so badly. My husband put me on a bit of a "remodeling freeze" for 2015. 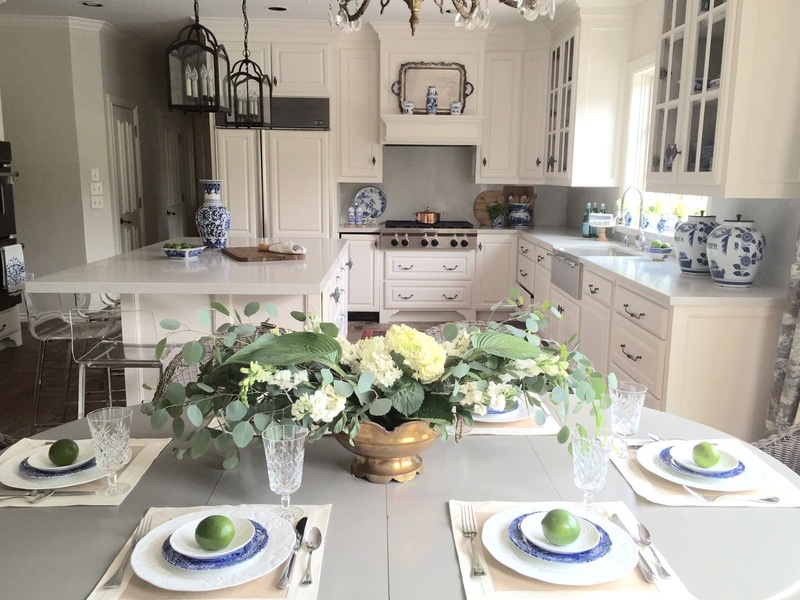 We have been soaking up family time and I am having fun remodeling clients' homes. So, I traded some work for a friend's seagrass rug and dug out some grasscloth wrapping paper (purchased last Christmas because I knew I'd find a use for it). Everything else came from shopping my home, advice Melissa often offers. You can imagine my delight when Melissa wrote a gorgeous Coffee Table book! FULL of Photographs, DIYs, Tutorials, and Practical Tips & Advice!!!! 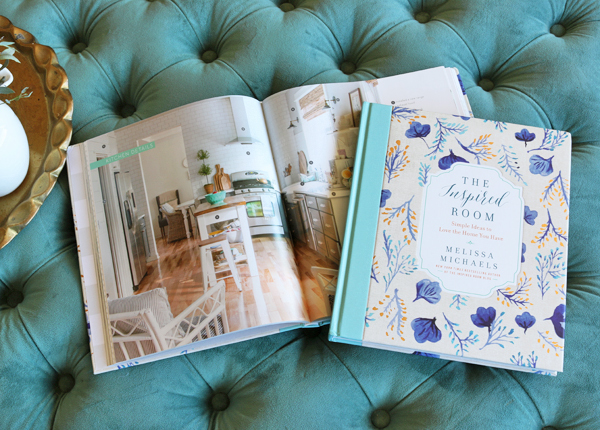 Melissa says it perfectly, "This book is unique, it's not a collection of photos of nice houses or designer rooms, it's a relatable book about creating a real life home on a budget, starting with what you already have. 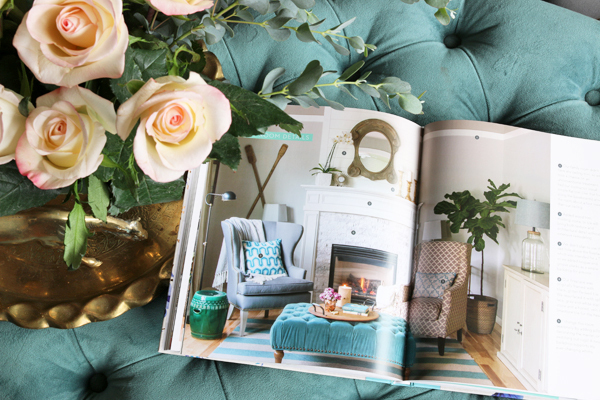 It has lots of photos and tips for decorating and making your house feel like home." and this is my home today: Completely Unstaged... deadlines looming, school projects due, piles of laundry, and dirty dishes; BUT I love my people who make the messes in our warm and cozy home. I'm off to fold laundry read my new book and sip some coffee.. Join me? Now for more super exciting news! *hint* giveaway! 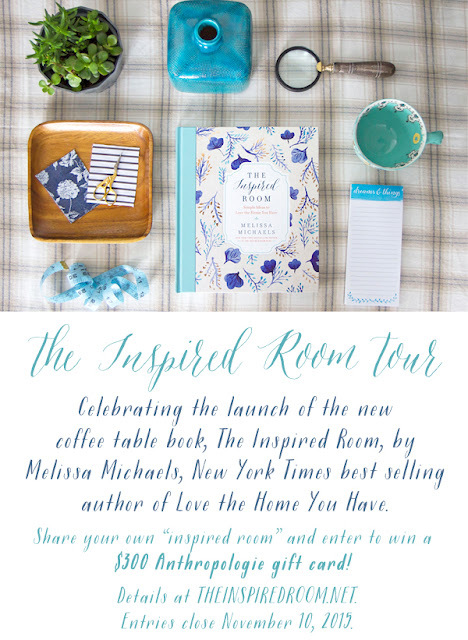 Also, you are invited to participate in The Inspired Room Tour AND you have the opportunity to win a $300 gift card to Anthropologie!! To enter, create a post with the requirements found HERE and submit your finished post URL link to that form HERE again. Entries are accepted until November 10, 2015. All details are on the form, so follow the links to win! What is your major source of Inspiration in your home? I'd love to hear in the comments! 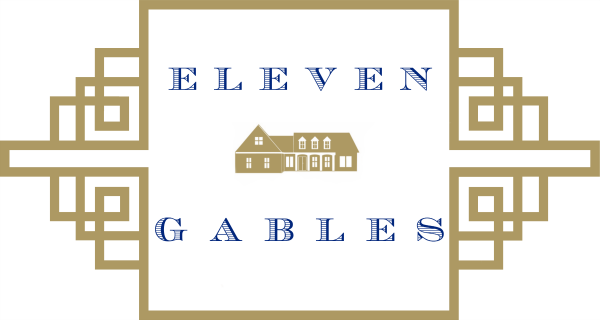 For a behind the scenes glimpse at life around Eleven Gables, follow me on Instagram, Facebook, Twitter, and Pinterest! What an amazing space you have--just gorgeous!! But I love the "lived-in" look just as much, because I can relate! And, yes, I love my people who make the mess also, and try to remember that when I'm picking it all up, lol! I love everything about your transformation. I would love to see what is now where the kitchen desk was. I need to transform my own family room -- this has given me lots of inspiration. I LOVED your post! I feel the same way after reading Melissa's awesome book, I'm shopping at home! I have to stage my master bedroom and I feel like I'm going to gather all my pillows and play with what I have! 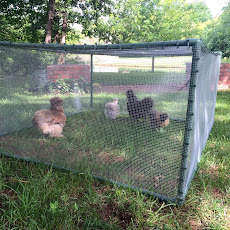 Your home is gorgeous and I especially love your keeping it real photo! Also, thanks for the link to our blog, we are linking to you as well, so I hope we drive some friends your way! Have a great day! Emily, you have a beautiful home. I love seeing your ideas and I appreciate the candid glimpses too. 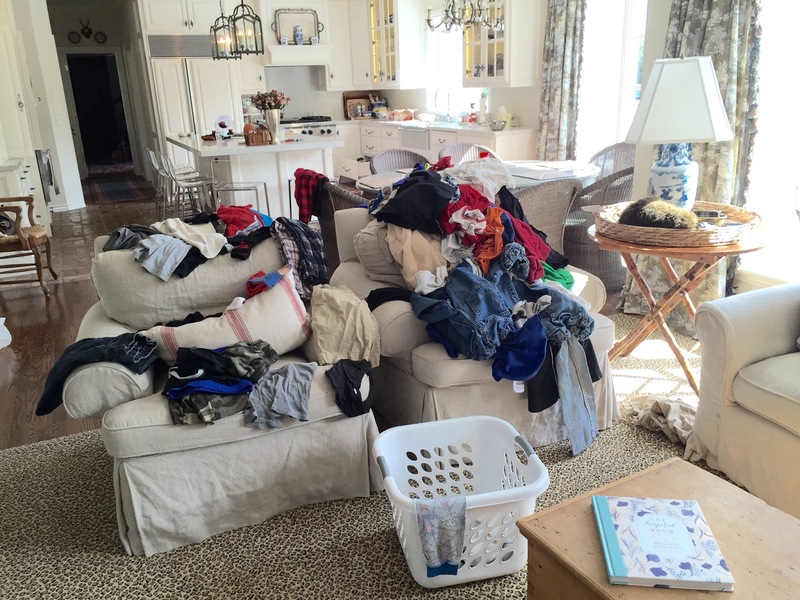 :) I can completely relate to the craziness of 4 kids worth of laundry and "messiness". Thank you for sharing your ideas and your inspirations. Just found you via Inspired Room. You're home is beautiful. May I ask how you lit your exterior Christmas wreaths on your upstairs windows? Beautiful transformation!! 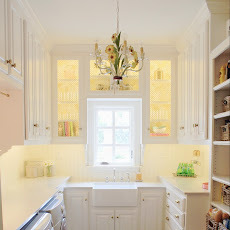 Could you tell me the source of your kitchen lights above the island? Were your slipcovers custom made? I love the rug in your family room. Where did you get it? Gorgeous! I found you from Cote de Texas- one of my all time fav's! Where did you find your barstool? Thanks! Hi!! I have linked to all of my products on my Before and After Post! Love it all! Don't know if you respond to back posts, but if so, I would love to know about your rug in the family room. Seems like a great option to disguise spills etc...my kids are now grown, so guess I can't blame it on them anymore?! Also...I spy a ceiling fan! Living in Texas, this is a necessary accessory during the summer. Yours appears a little more stylish than the one that came with our home- too ornate for my tastes...- any tips or info on yours would be appreciated!